Notes: No steel toed shoes required but you do need leather closed toe shoes. (other PPE will be provided for hearing and eye --- bring your own if you like). Nestled alongside the Cumberland Plateau of the Appalachian Mountains is the town of South Pittsburg, Tennessee (population 3,300). It was here that Joseph Lodge and his wife settled and, in 1896 opened his first foundry. Iron foundries have been recycling long before "being green" was cool. In 2016, Lodge broke ground on two new expansions. The first is a new distribution center for increased efficiency and shipping. The second is an entirely new foundry in addition to the current one. Both projects are within 2 miles of Lodge headquarters in Tennessee. The guided tour will visit the house and foundry to see how the Lodge family created the company and how their famous products are made. 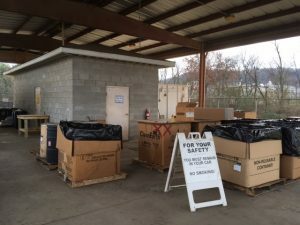 The Household Hazardous Waste Collection Facility allows City and Hamilton County residents to dispose of common hazardous materials generated within their residence. Trained staff are on site and ready to unload all acceptable household hazardous materials. All of the items collected are properly managed to be either reused, recycled, or disposed of in compliance with all federal, state, and local laws. The Wood Recycling recycles organic yard waste which is collected at the curbside by city collection crews, contractors, and homeowners. Wood waste from trees and trimmings as well as leaves may be disposed of at the wood recycle center at a standard rate for non-city residents and businesses.